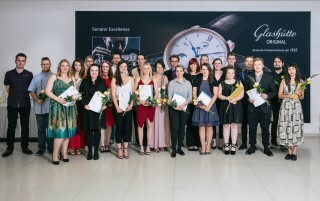 22 young watchmakers have graduated from Glashütte Original’s “Alfred Helwig” School of Watchmaking in Germany. Management and teachers at the school awarded the students with diplomas and congratulated the class but, the up and coming experts didn’t rest on their laurels for long, as the majority of them began work at Glashütte Original the next day. It took three years for the fifteen female and seven male watchmakers to complete their studies. They celebrated their achievements with two newly graduated toolmakers who had spent three and a half years studying to complete their course. Every year since 2001 Glashütte Original has trained watchmakers and toolmakers at its ‘Alfred Helwig’ watchmaking school, with students attending the training institute hoping to acquire the highest level of skills in the two professions. In the process, the teachers ensure that the students learn how to make the smallest movement components, comprehend complex mechanical relationships and gain an appreciation of the effort, precision and value that the manufactory dedicates to even the minutest of details. Along with theoretical knowledge, the curriculum offers a number of opportunities for students to gain insight into the practice of their trade and, during their apprenticeship, can participate in a variety of internships in selected assembly and customer service areas at the manufactory in Glashütte. As a world-renowned watch brand, Glashütte Original places particular emphasis on international standards of education in the field, a fact underscored by its partnership, unique in Germany, with the Swiss Watchmaking School, WOSTEP (Watchmakers of Switzerland Training and Educational Program) who provide the WOSTEP diploma as part of the programme.